Use this standard, a highly validated mammalian protein digest, as a quality control sample for mass spectrometry (MS) analysis of complex proteomic samples. 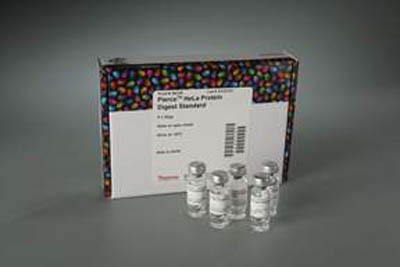 The Thermo Scientific Pierce HeLa Protein Digest Standard is a highly validated mammalian protein digest that may be used as a quality control sample for mass spectrometry (MS) analysis of complex proteomic samples. The protein digest standard is derived from a well-established adenocarcinoma reference HeLa S3 cell line. HeLa S3 cells express over 15,000 proteins with relevant post-translational modifications, making this cell line an ideal standard for complex proteome mass spectrometry applications. The cell lysate has been digested with both LysC and trypsin to minimize tryptic missed cleavages and improve protein sequence coverage. Moreover, unlike other commercially available protein digests for MS, the Pierce HeLa Protein Digest Standard meets stringent quality testing specifications, including peptide quality, digestion efficiency, and lot-to-lot digest uniformity. The Pierce HeLa Protein Digest Standard is a lyophilized tryptic peptide mixture that can be used as a quality control standard for liquid chromatography (LC) separation, MS method development and MS performance benchmarking. The digest is specifically formulated for LC/MS experiments and does not contain salts or detergents. Using the digest standard routinely before analysis of complex samples makes it possible to monitor and normalize LC/MS performance between samples and over time.